Jim passed away on December 5th, 2018. He was born in Kalamazoo, Michigan, and moved to Moline, Illinois, at the age of two. He graduated from Moline High School Class of 1961. He started playing golf at age 7 at Oakwood Country Club in Moline. He was a two-time All State golfer for MHS. He then attended Oklahoma State University where he was an All-American and a member of the Cowboy’s 1963 NCAA Championship golf team. Jim served in Vietnam before turning pro in 1968. He joined the PGA Tour in 1970. He played in about 180 PGA Tour events from 1970–1978. His career year was 1972 when he won the Western Open and had eight other top-10 finishes in PGA Tour events including a T-5 at The Masters and a T-2 at the PGA Championship. He had four top-6 finishes in major championships between 1971–1973. In 1972 he played in the World Cup in Australia. An injury forced his retirement from the PGA Tour in 1977. After the injury, he became the head club pro at the Greenbrier Hotel in White Sulphur Springs, West Virginia, a position once held by ”Slammin’” Sammy Snead. He also chaired the Ryder Cup when it was held at the Greenbrier in 1979. Jim's career highlights include time as a teaching and club pro including lead instructor at the John Jacobs Golf School, head pro at The Pines Golf Club, head pro at the Pete Dye Golf Club, Director of Golf at Whitewater Golf Club in Thunder Bay, Ontario, and as operator of the Jim Jamieson School of Golf at the Resort at Glade Springs in Daniels, West Virginia. He also owned two golf courses for about 6 years. Jim was a long-time supporter of youth golf in West Virginia. He volunteered on the Callaway Junior Tour and held clinics to specifically try to grow the game among girls in the state. An old friend from Moline told a reporter that Jim always remembered his Moline High School roots, calling to him “Hey, Maroons” whenever he saw him. A very good friend of mine played with Jim in a Pro/Am many years ago. My friend told Jim that he had a friend from Moline. Jim claimed he remembered me. I always said that he was just trying to be nice. I remember shooting baskets with Jim when I was a " bench warmer" on the 1960-1961 basketball team. He was a great guy and could make the long range shot to win the game of horse. My sympathy goes out to his family. When I was at the University of Dubuque, one of the guys on our golf team found out I was from Moline asked me if I knew Jim. His name was Bill Kramer from Cliinton, Iowa, and he knew Jim through Mississippi Valley Conference play. Bill said Jim was well known in the conference for his dominate play. Another proud "Maroon Moment". Rest in Peace. Oh, do I remember Jim when he won the Western Open and I was fortunate to see him....and the John Jacob golf lessons many moons ago. I credit him for keeping my golf scores in the 80's to this day. The distances are shorter but he taught me the right swing plane. A wonderful person and am sorry for his passing. Jim was a good guy, and, to my knowledge, the best golfer the Quad Cities ever produced. I met Jimmy in the Letterman’s club in 1960. The summer of 1960 I worked at Oakwood mowing greens. Jimmy had a spot to the left of the first tee where at 530 AM he would be hitting tee shots at the first green. I followed his Western Open victory and later followed him at the PGA at Oakland Hills in Detroit. He picked me out of the gallery for a wave. He was playing with Chi Chi Rodriquez so there a big crowd. When I moved to Tallahassee I found that his family had brought him here in the winter when he was younger to play Capitol City Country Club. I met many folks who knew him in the late 1950s. He helped get the Tallahassee Open going like the JDClassic. He played exhibition and I followed him again. Most memorable were his personnelly customized clubs and the driver with extra loft that he could hit towering drives that made for oohs and aahs from the fans. My sister Sue followed him in the Dayton and Cincinnati area at tournaments. Sue got a big kick out Jimmy walking to her in the gallery and saying “your from Moline thanks for following” Sue and her husband had dinner with him later. Jim and his parents lived next door to us on 12th Street in Moline before moving to the Crestwood Addition. His Mom, Teresa, and my mom were good friends and kept up their friendship even after they moved. They were good neighbors and a great family. 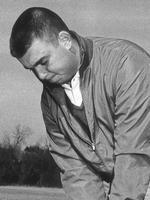 Jim was one of Moline's great sports athelets who gave us excitment during his professional golf career. I would try to follow him during his professional days, it was always a joy to talk about someone you attended school with. I ask the Lord to Bless his family during this time of sadness.